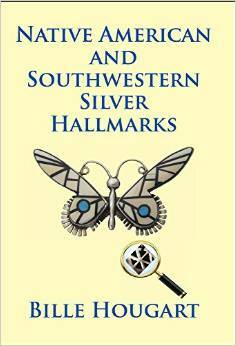 Native American jewelry enthusiasts, collectors, wholesalers and retailers alike often refer to Bille Hougart’s book (Native American and Southwestern Silver Hallmarks, 4th Edition) as the “bible” and the most useful book on identifying Native American hallmarks. This 8 1/2″” x 11″ fat paperback has 507 pages. The bulk of the book, pages 34-416, consists of an alphabetical (usually by last name) list of artists. 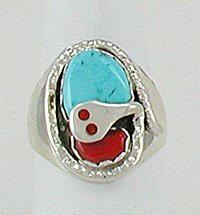 In many cases there is a photo of the hallmark along with biographical information such as tribal affiliation, birth date, types of jewelry usually made, family member of note and more. 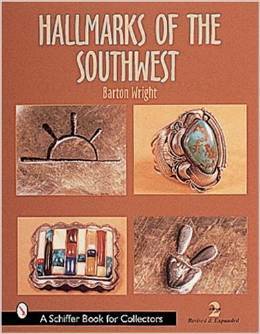 There is a 10 page section in the front of the book that discusses the history and function of the Indian Arts and Crafts Board. The back matter contains an alphabetical listing of marks. This list is of the actual marks, different from the body of the book which is alphabetical by artists’ last names. This makes several ways to find who a mark belongs to. Then there is 42 page section of symbol marks by category such as Paws, Sun etc. 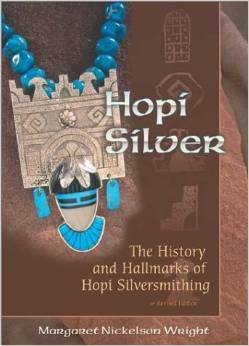 If you have interest in Native American jewelry and need to identify hallmarks, this book is essential.